Courses : MBA / MBA (Evening) / MBA (Integrated), BBA, M.Sc. (CS), B.Sc. (IT), BCA, MAMC, BJMC, M.Lib., B.Lib., B.Ed. Extracurricular Activities : Sports, Literary and Cocurricular Activity Clubs, Cultural Programmes & Association with SPICMACAY, various Competitions, Sparsh Ganga, Red Ribbon Club, Tree Plantation through NSS. Brahmavid brahmaiva bhavati. The knower of the Brahman becomes the Brahman. Here knowing and being are one and the same. You not only know that you are infinite Consciousness-Bliss, but you become this infinite Consciousness-Bliss. To know Truth is to be the Truth. All Knowledge should and will ultimately lead to Knowledge of Brahman. Pursue Knowledge passionately with all the love of your heart, the attention and concentration of your intelligence, with all the energies of your will. Knowledge builds character. Knowledge is power. Knowledge is light. Knowledge unfolds various abilities, capacities and brings you, when these abilities and capacities are put to use, immense wealth. Knowledge leads you to God-experience. The ultimate aim of every form of Knowledge is experience of the supreme Happiness, supreme Peace, infinite Knowledge, and supreme Perfection. Obtain the highest Knowledge, the Knowledge of your inner Being as the ultimate Reality, the absolute Life, the source of all Perfections. Gain a Knowledge that is all-independent, self-sustaining, all-perfect, unconditional and eternal. Guided by Wisdom all forms of Knowledge lead to the Knowledge of all Knowledges, the Supreme Knowledge. Brahmajnana is Brahma-Anubhava, the Knower of Brahman becomes Brahman himself. Entering OIMT one feels immediately touched by the heavenly garden full of fragrant and beautiful flowers. The place away from the busy and noisy town, surrounded by forest, with view to the holy Ganga, is truly an ideal environment for a student. The Institute is affiliated to different Universities and is specialized in the subjects of MBA / MBA (Evening) / MBA (Integrated), BBA, M.Sc. (CS), B.Sc. (IT), BCA, MAMC, BJMC, M.Lib., B.Lib, B.Ed. Students are coming from all parts of India and use the modern hostel facilities provided by the Institute. BBA, BCA and M.Sc. (CS) are affiliated to the H.N. Bahuguna Garhwal University. MBA is running under the norms of AICTE, New Delhi, and is affiliated, with all other courses, to the Uttarakhand Technical University, Dehradun. B.Ed. course is approved by NCTE and affiliated to H.N. Bahuguna Garhwal University. Latest Computer Technology, fast Internet facilities, Audiovisual equipments and extensive Libraries give the students the maximum for a good learning progress. To widen knowledge in particular fields, top Guest Lecturers from various sectors are constantly invited. Professors from Universities, who are teaching in other countries, like Canada, the United States, etc. present our students with an excellent possibility to get a wider view also of the systems in other countries. Specialists in placement are working very hard to provide the students good job facilities with the view for a constant enrichment in their work. Already many students of this Institute have got jobs in multinational companies and are doing very well. OIMT is proud to have one of the famous Educationists of the country, Prof. J.L. Gupta, Former Principal of Shriram College of Commerce, Delhi University, and former Vice-Chancellor of Chhattisgarh University, as an active Chief Advisor for the Institute. 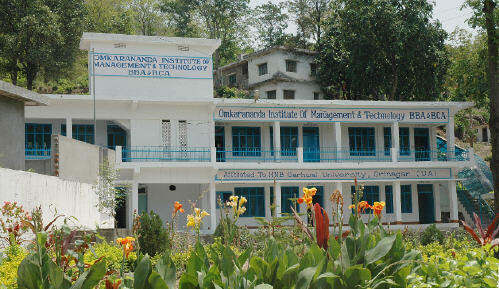 Omkarananda Institute of Management and Technology, Rishikesh was established in the year 1999 with a vision to impart professional education to the students from all over the country. Initially MBA, BBA and BCA courses were launched, later on M Sc (Computer Science) and other courses like PG & UG in Mass Communication, PG & UG in Library Science and B Sc (IT) were also added to the Institute. From the beginning the Courses at OIMT are duly approved and affiliated by the University. OIMT is committed to maintain the highest standards of education and provide students with quality education and professional career. OIMT is surrounded by ancient Temples and Ashrams, the main attraction being a most beautiful Temple in South-Indian style, Omkarananda-Kamakshi-Devi Mandir, which is a landmark in Uttarakhand, and situated only 5 minutes' walk from the Institute. That is how the spiritual vibrations and scholarly atmosphere of Muni-ki-Reti and Rishikesh make OIMT a natural choice for education and learning. OIMT has a beautiful lush green sprawling campus, spread over more than seven acres of land with well manicured green lawns, flower beds and natural surroundings of hills and forests and view to the Ganga, energizing the students and thus providing excellent learning environment. 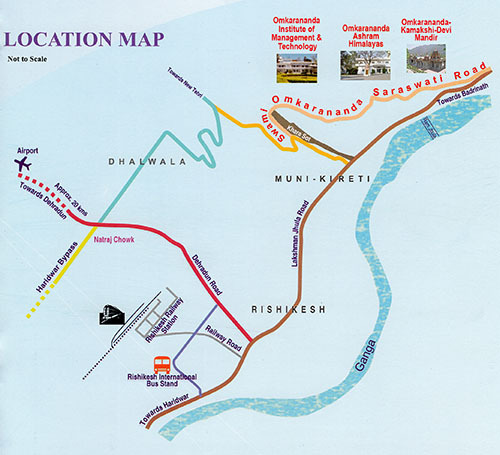 The Campus is pollution free, quiet and peaceful and is located near the famous Ramjhula Bridge over the Ganga and accessible from the city centre. The Institute has all the facilities to provide students with quality education and facilitate better learning. The holy river Ganga, surrounding hills and green forests add to its grandeur and beauty and make it more suitable for study and learning. The serene environment of the campus encourages the students' learning process through well maintained lecture halls, well stocked libraries and state-of-the-art computer labs. OIMT is privileged to have an extensive and well developed infrastructure. 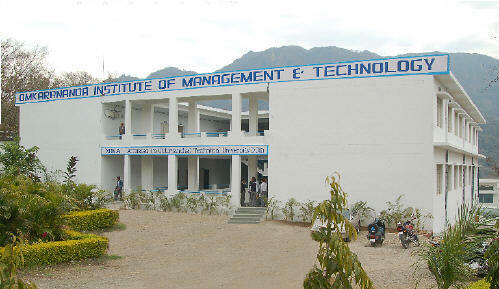 The Institute has separate Academic Blocks one for MBA and others for various other professional courses. There is adequate number of lecture theatres in each block. OIMT has two huge libraries with a collection of books and subscription of journals, periodicals and news papers. 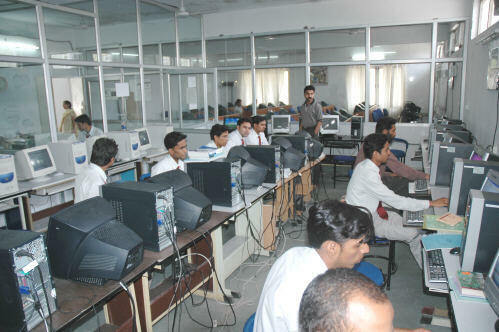 Computer Labs at the Institute are equipped with latest Hardware, Software and 24x7 availability of Internet. In addition to this the other facilities in the campus are Auditorium, Activity Rooms, Outdoor Sports Ground, Cafeteria, Common Rooms, Seminar Halls and separate Boys and Girls Hostels for a better and comfortable stay during the course of study. Lecture theatres are the basic requirement in the Institute which is a decisive factor for the quality of teaching. OIMT has large and spacious, airy and fully ventilated lecture theatres with big size white boards. The Lecture theatres also have mounted LCD projectors facilitating better teaching with latest pedagogical techniques. All audio-visual aids are also available to make learning interesting. The Library is the most important and vital organ of an Institution as it is the central source of knowledge and information for all the knowledge seekers. 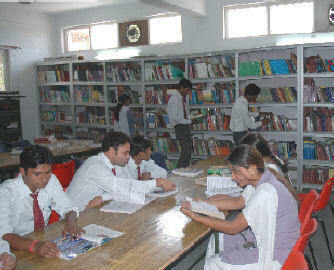 OIMT has separate well stocked Libraries for MBA and other programmes. Libraries at OIMT are accumulated with rich versatile collection of books and periodicals which create a reservoir for students to help them refining their knowledge through the huge stock of books from renowned authors. OIMT houses more than 18000 books, 53 national and 20 international journals, various magazines, e-database of international journals of repute like EBSCO and J -Gate covering different subjects of Management and Technology giving access to more than 50000 research papers. The Library has subscription of more than 14 National and Regional Newspapers. A separate reference section has a rich collection and provides access to a wide range of books and authors from all walks of life. Besides this there is a collection of CD-ROM publications, audio & video cassettes and CDs, Technical Reports, Dissertations etc. The OIMT Library is linked with DELNET which gives an opportunity to faculty and students to be in touch with other National Libraries. The Computer Lab is the central nervous system of any Technical Institute and has to be equipped with best and updated technology. OIMT believes in providing extensive global exposure and linkages to its students and faculty members through the internet and to enable them to be constantly updated with the current trends in the corporate world. Keeping this in view OIMT has built an excellent infrastructure of computer labs using the latest software, tools and technologies, with a liberal access to internet for all students through Wi-Fi 4mbps lease line and 15 high speed broadband connections which also provide mobile connectivity to LAN and Internet to the whole campus and a centralized data hub that takes care of unification of the system and makes check over any unauthorized access. MSDN- academic alliance legalizes all the software used by the Institute. OIMT campus has been networked for total connectivity. OIMT has a large air conditioned Auditorium having a comfortable seating capacity for 200 persons equipped with LCD projectors, screen, PA system. The Auditorium facilitates various Academic, Extra- and Co-curricular activities like focus talks, seminars, presentations, guest lectures, workshops, debates, quizzes, public speaking and personality development programmes. In addition to this a big Multi Purpose Hall is also available for other student activities. The OIMT Campus has a big Cafeteria at a separate building that serves the Faculty, Students, Staff and Guests for 7 days a week. The Cafeteria has been designed and equipped with modern hygienic mechanized kitchen consisting of all the facilities to serve delicious breakfast, lunch and snacks to all including the boarders and day scholars. From the Cafeteria one has a breathtaking view over the Himalayan foothills and the Ganga. OIMT provides its students with separate residential facility for boys and girls. Hostels at OIMT are fully furnished with all the required furnishers and fixtures. Hostels give such a relaxing yet highly conducive environment for studies that it feels like 'home away from home' for all the students. Students are provided with other facilities to make them feel comfortable such as communication facilities, common room and TV with cable connection, running hot water during winter, water cooler and power back up. A Doctor also visits twice a week for the medical checkup of resident students. Indoor game facility is provided to the students for their entertainment and stress busting. Both the both hostels have dining facility through their own separate Mess where hygienic, purely vegetarian and sumptuous food is served. The registration for hostel is done on first-come-first-serve basis. OIMT offers basket of such Professional Courses both at PG and UG level that are duly approved by the Government Agencies and affiliated to University. The courses offered at OIMT are the ones which are the need of hour, and the demand for the people having such degrees is very high. The courses at OIMT are offered through various Schools of Studies. Under the School of Management Studies MBA and BBA courses are offered, MBA offered in 1st as well as in the 2nd Shift is duly approved by All India Council of Technical Education (AICTE), New Delhi and affiliated to Uttarakhand Technical University (UTU), Dehradun while BBA is affiliated to HNB Garhwal University, Srinagar (Garhwal). This year a new 5 year integrated programme Master of Applied Management (MAM) is also going to start with the approval of AICTE. All Management programmes are aimed at transforming young aspirants into successful and effective Managers; the prime focus of the programme is to prepare Professionals who would take up leadership positions in organizations across industry, government sectors and NGOs. The programmes are offered in such a way so that the youngsters may be equipped with the basic set of knowledge, skills and aptitudes that are required of them in corporate and other organizations. All this is achieved through a well crafted set of academic and Co- and Extra-curricular activities, delivered by a mix of experts from academia and industry. MBA at OIMT is a Two year full time Postgraduate Degree Programme in Business Administration offered in both Morning and Evening shifts. Eligibility: Graduation in any stream with valid score in MAT/CAT/NAT/UTUPGEE/ Other recognized common entrance exam. Under this School courses offered are MSc (CS) at PG Level and BCA and BSc (IT) at UG Level. MSc (CS) and BCA are affiliated to HNB Garhwal University, Srinagar (Garhwal) and BSc (IT) is affiliated to Uttarakhand Technical University (UTU), Dehradun. All the programmes are designed to equip students with the technical competencies required in the field of Software and IT. BCA at OIMT is a Three year full time Graduate Degree Programme in Computer Applications. BSc (IT) at OIMT is a Three year full time Graduate Degree Programme in Information Technology. Today the Importance of Journalism and Mass Communication has increased tremendously. The demand for the qualified persons in the field of Journalism and Mass Communication has also gone up rapidly. New media in this field has taken over and avenues have opened up for the trained professional. Under the School of Journalism & Mass Communication MA-MC is offered at PG and BJMC is offered at UG level. The both courses are affiliated to Uttarakhand Technical University (UTU), Dehradun. MA-MC at OIMT is a Two year full time Postgraduate Degree Programme in Mass Communication. BJMC at OIMT is a Three year full time Graduate Degree Programme in Mass Communication. Under the School of Library and Information Science MLib and BLib are offered at PG and UG level respectively. The courses are affiliated to Uttarakhand Technical University (UTU), Dehradun. M Lib at OIMT is a One year full time Postgraduate Degree Programme in Library Science. B Lib at OIMT is a One year full time Graduate Degree Programme in Library Science. Under the Teacher's Education B.Ed. is offered at UG level. The course is approved by NCTE and affiliated to the H.N. Bahuguna Garhwal University. B.Ed. at OIMT is a One year full time Graduate Degree Programme in Education Science. Omkarananda Institute of Management and Technology is a renowned centre of excellence in the field of professional education. The Institute is known to maintain high standards of academic and extra-curricular activities based on industry relevant curriculum. The Institute is known for its experienced faculty, robust infrastructure, discipline, values and the highly focused and energetic student community, who are proving to be prized and valued by the industry also. OIMT has a fully functional Training and Placement Cell, which aims at enhancing the employability of the OIMT pass outs by giving them an opportunity to improve upon their personalities through proper training. The Institute lays serious emphasis on holding Student Development Programmes for developing their Communication Skills, Soft Skills, Attitude, Computer Competency etc. through organizing seminars, workshops, guest lectures, industrial tours and Entrepreneurship Awareness Camps. - Opulence Distribution Pvt. Ltd.
- HBL Global Pvt. Ltd.
At OIMT we believe that Training and Development is an integral part of the course of study in the professional courses. Through such holistic and inclusive training programmes, we emphasize not only on empowering our students for their communication skills in Global English and Business Culture but also ensure their overall personality development, improve management and analytical skills, critical thinking, corporate etiquette and Interview handling skills. Along with that we give them a deep understanding of Global culture. This unique and innovative approach has given us a cutting edge in terms of providing win-win situations to our students not only to emerge as winners during placements, attract best employers to our campus but also forming life-long winning habits of management and leadership. An in house personality development programme for students of all the courses was developed with an aim of giving them a proper direction, developing positive attitude and to help them overcome their shortcomings and hesitations. With an aim of bridging the gap between the Institute and Industry, OIMT, under the sponsorship of AICTE, has started Institute to Industry (i2i) programme. Under this Programme a series of lectures is organized where renowned persons from Industry and Academia are invited for interaction with the students and industrial tours are also conducted. The Institute organizes variety of programmes under this Cell where the eminent speakers from Industry are invited and the students are sent to the floor of the plant to understand real life business problems. The Institute has also started an Entrepreneurship Development Cell under the sponsorship of AICTE and Entrepreneurship Development Institute, Ahmadabad, with an aim of developing Entrepreneurial attitude in students of all domains so that they can generate more employment opportunities for themselves and for the society in which they operate. Keeping this in mind the Institute organizes various programmes at regular interval to promote entrepreneurial aptitude. Under this cell the students of OIMT get opportunity to interact with the Entrepreneurs and professional from Industry, Banks and Institutions of Excellence. Besides this Entrepreneurship Awareness Camps and Faculty Development Programmes are conducted. As part of OIMT's focused approach to providing real time industry exposure to the students, the students of OIMT undergo two months summer training in the Management Programmes, which help students to better equip themselves and to be ready to respond to Industry challenges and also help them in saving the "training time" when they join their workplaces. Among various career counseling activities of OIMT, industrial visits are also conduced for the students with an aim to go beyond academics. These visits are arranged to develop the insights of the students for attaining practical knowledge and their theoretical applications thereof. Industrial visit is considered as one of the most tactical methods of teaching. The main reason behind this is that it allows students to know things practically through interaction, working methods and employment practices and also gives exposure from academic point of view. OIMT has a bundle of amenities which gives a safe and comfortable environment to all the members at OIMT. The Institute maintains a Pantry for the Faculty and Staff Members where the facility of tea & snacks is available round the clock. Availability of safe and clean drinking water is assured through RO system. Sufficient provision for student's health checkup is maintained by regular campus visit by a certified Doctor, and a sick-room is also available within the campus. Continuous uninterrupted power supply is maintained throughout the campus by heavy power generator. The Institute has two College Buses for the pick-up and drop facility of the day scholars from specified location en-route between Haridwar and Rishikesh, on payment of a nominal fee. At OIMT the learning is not just restricted to classrooms, we adopt a holistic approach for the development and uses of various need based training and learning inducing techniques and attach equal importance to extra-curricular activities. Under Performance Improvement Plan (PIP), the students who need special attention in terms of studies are mentored and absenteeism counseling is administered for better performance and real gains. At OIMT various programmes are conducted at regular interval to showcase the richness of Indian cultural heritage along with global literary masterpieces. OIMT conducted a classical music programme by Pt. Kaivalya Kumar Gurav, one of India's youngest classical music maestros in association with SPICMACAY (Society for Promotion of Indian Classical Music and Culture Amongst Youth). SPICMACAY is an international organization that works to promote Indian Cultural Music amongst the youth at a global level. OIMT has also organized an International Film Festival in association with SPICMACAY and showed the classic works of renowned Directors like Akira Kurosawa, Satayajeet Ray, Charlie Chaplin, etc. which gave the students a preview of Classic Cinema and fine Direction. In order to enhance students' creativity and innovation, various activities are run under various Clubs. The students run their activity through Marketing, Human Resource Management, Finance and Information Technology Clubs. A Movie Club is also there that organises shows of the best Hindi and Hollywood Movies. Under the aegis of Student Development Cell various activities are conducted for an overall development of the students. These activities help students to explore their true potential and give them a holistic development of mind and soul. For the all-round-development of students, OIMT ensures that students take part in sports activities also. Various sports events are organized round the year to achieve this objective. OIMT remains interested to organize various intercollegiate sports events. In the year 2012 OIMT was the proud host of Intercollegiate Tournament of Uttarakhand Technical University, Dehradun, where teams from all over the State participated in Table Tennis, Basket Ball and Volley Ball, in both men and women categories. Another feather to the cap was added, when OIMT Men's Volley Ball team brought home the Champions Trophy for the second consecutive year. Along with its responsibility towards students, OIMT understands its responsibility towards the whole Society at large and takes steps forward and initiates drives to give back to the Society. In this connection the Institute organizes blood donation camps with active participation from students and all the staff members. In the year 2011 the OIMT Representative was awarded as the Best Nodal Officer for collecting maximum units of blood in a single blood donation camp. The Institute also has one Unit of National Service Scheme (NSS) for its students. In collaboration with NSS the Institute has organized some major social awareness programmes. On Uttarakhand Foundation Day, students and faculty member of the Institute planted many trees, pledging to save the environment and contributing to the noble cause. On World AIDS Day, OIMT, in collaboration with NSS, conducted a rally spreading awareness about AIDS and forming a Red Ribbon Club for continuous awareness about AIDS in the general public. On the occasion of Sparsh Ganga Day, the Institute organized various programmes in association with NSS including an environment centric cleanliness drive within the Campus and the nearby areas. Under NSS camps of varying duration are also organized where students participate and understand their social responsibility with enjoyment. For more information please visit the website of Omkarananda Institute of Management & Technology (OIMT), Rishikesh, at www.oimt.ac.in. OIMT carries a very special Logo. The book stands for Saraswati, the Goddess of Purity, Knowledge, Art and Culture. The red-golden fire flame symbolizes the aspect of Lakshmi, the Goddess of spiritual and material Wealth, Prosperity and Abundance. The Lotus in the triangle below stands for Tripurasundari, the Goddess of infinite Perfection, Power, divine Wisdom and Beauty, and the most holy syllable 'OM', in the Centre, includes all these aspects and also transcends them. In the Logo one finds an important saying from the Vedas, a "Mahavakya": "Prajnanam Brahma", which means "Knowledge is God". It should remind the students of their higher aims and purpose of life on earth.